My uncle Herbert Hirschland and his brother Rudy came to the Netherlands before the war started because of the rise of Adolf Hitler. Frits’ father, my Uncle Herbert, hide from the Germans in both my grandparents’ houses. He hid in The Hague (in a basement). My grandfather (Leen Boender, my father’s dad), was a member of the resistance in Rotterdam. He helped Jews with false passports and food stamps (ration coupons?). Uncle Herbert lived in their house in 1943/45, and before that he he lived in a chicken house. 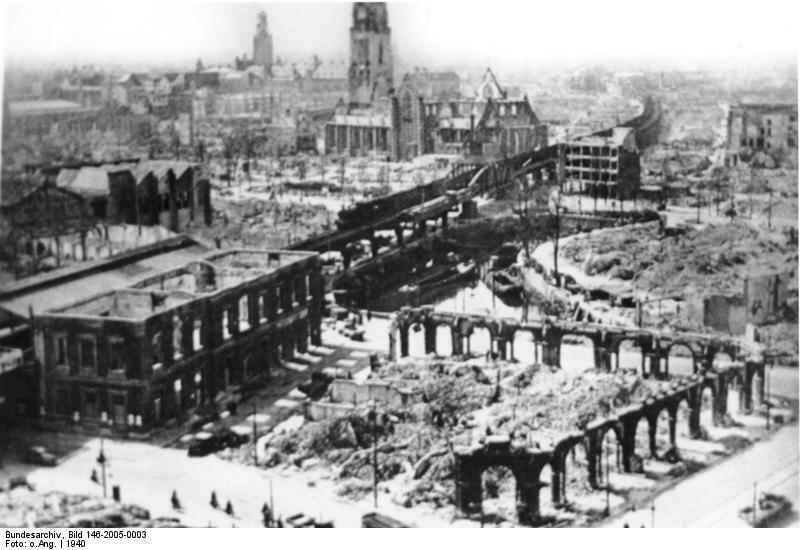 Rotterdam after the 1940 Blitz. Photo from Wikipedia. My grandmother’s (Elizabeth) father, Wilhelm Marx, owned a substantial printing concern in Munich. My grandfather Hans worked in that business. Sarah Hirschland’s first letter to me said “congratulations, you have found the only Hirschlands in Israel.” Through Facebook, I connected with Sarah and a couple of her daughters, and was thrilled to find that some of our family had made it to Israel, though at the time it was still Palestine.